Mitosis has retained its fascination ever since the first beautiful pictures drawn by Walther Flemming in the late 19th Century. Now, with modern molecular and cell biological tools, equally beautiful pictures are being created as the molecular mechanisms underlying mitosis are elucidated. As our understanding of the molecular machinery of the division apparatus expands, there has been a dramatic resurgence of interest in understanding how cells take the initial decision to commit to division and then exit mitosis once division is complete. The emerging picture is one of sophisticated interplay between protein kinases, protein phosphatases and ubiquitin ligases in both time and space. Big, important questions have emerged that cannot be answered without integrating knowledge from a wide variety of disciplines. 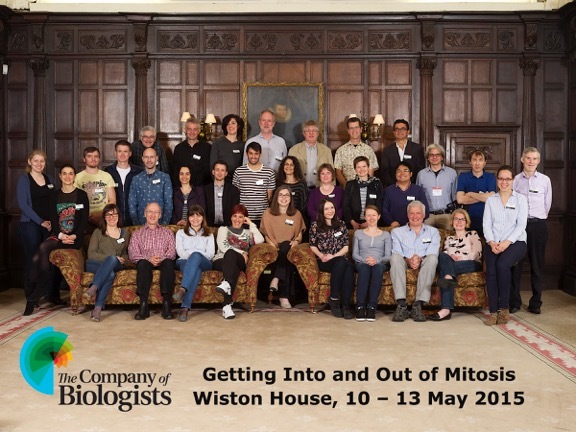 This Workshop aims to draw together researchers tackling the problems of getting into and out of mitosis in different systems and with different approaches – biochemical, cell biological and computational. We aim to bring together researchers who tackle this problem with a variety of approaches in a friendly and interactive setting to address the fundamental questions that are posed by the whole process of mitosis, from what is the initial trigger, to how the cell ensures that chromosomes are correctly segregated, to how cells coordinate reentry to the next cell cycle. The Company of Biologists’ Workshops only take place three times per year, on topics that are driving forward the progress of life sciences and biomedical research. The meetings are small and intensive, taking place over 3 days with 20 invited participants, all of whom we ask to make a presentation, and a further 10 chosen from submitted applications (students and post-docs as well as PIs). A condition of attendance is that you are present for the full meeting, from Sunday lunchtime through to Wednesday lunchtime. 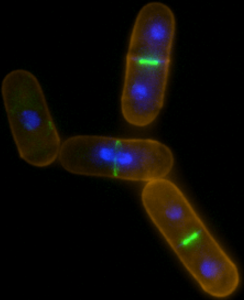 Cell division in fission yeast – Cell walls are stained with TRITC-lectin, chromatin with Hoescht 33342 while Cdc15.GFP marks the cytokinetic contractile actin rings of these living cells. Credit: Dr. Victor Alvarez-Tallada, Universidad Pablo de Olavide/CSIC, Sevilla. 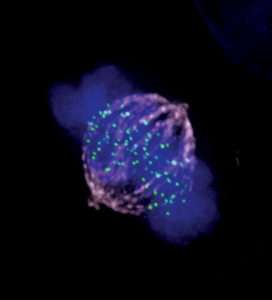 A mitotic human RPE1 cell with a single unattached kinetochore staining for the Spindle Assembly Checkpoint protein, Mad2. Cells are stained to show tubulin in magenta, DNA in blue, kinetochore staining in green, Mad2 in red. Credit: Dr Philippe Collin, The Gurdon Institute, Cambridge.